The new Moto X is 'always listening' - and so is the NSA! If you have a secret double life, for crying out loud don't tell anyone at Motorola: that firm's leakier than a pair of woollen swimming trunks. We knew so much about the Moto X that Motorola could have saved a great deal of time at the product launch by going on stage, waving it around and simply saying "yup." Was it worth the wait? 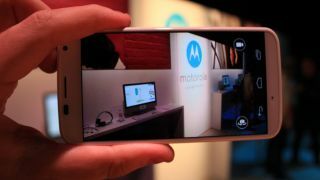 Hmmm, says Marc Flores: "While it is a pretty good smartphone by today's standards, all the talk about the Moto X revolutionising the mobile industry was unfounded." Michelle Fitzsimmons is on the customisable case and explains what's inside: "The processor is a Qualcomm Snapdragon S4 Pro running a 1.7GHz dual-core CPU and Adreno 320 GPU. The Moto X lacks a memory slot, and it houses 2GB of RAM. The standard Moto X variant is 16GB, with a 32GB available online." More specs? "The battery is a 2200mAh juicer that can last through 24 hours of mixed usage, Motorola said, with talk time up to 13 hours. It runs Android 4.2.2 and features a 10MP RGBC camera on the back and a 2MP image taker on the front. The front can capture 1080pm HD video while the back only normal 1080p." The camera's Clear Pixel images promise much better low light performance, and the X can tell when you're taking the phone out of your pocket and launch the camera app automatically. The standard phone is black or white, but from the summer onwards you'll be able to choose from 18 different back colours, as well as accent options. That means there are more than 2,000 possible colour combinations. Customisation aside, is it any good? Luke Brown is cautious. The specs aren't much, but "Where Motorola really shines is in the way its managed to make the Moto X all about the user, whether it's in the control or the design, and that could go a long way with consumers tired of the same few colors and styles most manufacturers have been relying on." The Moto X is "made for you", says Motorola - but only if "you" are in the US, because so far the Moto X isn't coming to Europe or Australia. According to Chris Smith, the made-in-the-USA smartphone "is so American than Motorola isn't letting anyone else in the world get their hands on the device." Even Americans aren't supposed to get their actual hands on the device: the phone constantly listens for voice commands. Assistant Editor Lily Prasuethsut reckons that "has taken the Moto X to a whole new level of creepy. A phone that's listening to me all the time? Really?" You know who else is listening to you all the time? That's right - the Feds! The ongoing revelations about the NSA's snooping powers reached a new and even more frightening level this week with the disclosure of XKeyscore. XKeyscore "allows for 'real time' interception of a person's web activity - and to target a single person, all the NSA needs is a phone number or email address." Not only can it monitor pretty much anybody on the planet whose communications go through US servers, it will also target you if you try to circumvent it. Using encryption makes you a person of interest, and the NSA intercepts and decrypts your communications to see what you're up to. While it's a US system, further revelations in today's Guardian show that GCHQ in the UK and the NSA in the US are big pals, swapping information with one another. Remember back when GCHQ said it wasn't developing internet spy tech? That was true: according to the Guardian revelations, XKeyscore was up and running and GCHQ was already benefiting from it. The only good news is that the data can't be held forever: XKeyscore is storing so much data that it can't physically store it for more than a few weeks. Or at least, that was the case a few years back. Ladies and gentlemen! It's time for tinfoil!